For many years, the streetcars in Lakewood played an important role in transportation. 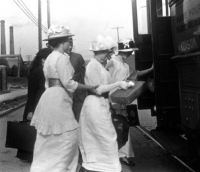 Men commuting to work often rode shoulder to shoulder with women who were running errands or making social calls. Here, riders prepare to board at a stop on Madison Avenue during the early 1900s.